London: Parliament House (designs for). 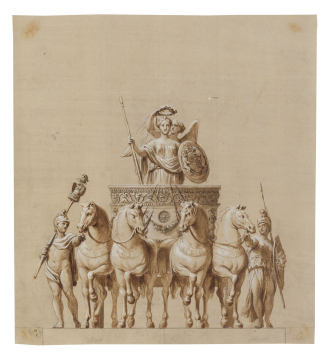 Design for a sculptural group on a plinth, showing a Quadriga, a chariot drawn by four horses, the two outer ones held by a male and a female figure in military apparel. It is driven by a female figure with spear and shield with royal arms, crowned by a winged victory. You are here: CollectionsOnline / London: Parliament House (designs for). Design for a sculptural group on a plinth, showing a Quadriga, a chariot drawn by four horses, the two outer ones held by a male and a female figure in military apparel. It is driven by a female figure with spear and shield with royal arms, crowned by a winged victory. The set of pen and wash drawings with heightening, Adam vol.7/21-44, are all designs for the relief decoration of James Adam's Parliament House scheme of 1762/63. The predominant theme is British history and the figures are dressed in either early seventeenth-century or classical costume. The principal draughtsman was Antonio Zucchi (1726-95), although some of the figure compositions are probably the work of Agostino Scara. Adam gave great emphasis in his Parliament scheme to the role of decorative sculpture and this probably explains the survival of so much material of this sort. In his unfinished essay on architectural theory of 1762, Adam explained: 'What is meant by outside decoration is sculpture, statues and bas-reliefs, together with foliage, trophies, frets, interlacings and a thousand such ornaments which, if properly applied, give such amazing magnificence and render an ediface so wonderfully interesting...' (J. Fleming, Robert Adam and His Circle in Edinburgh & Rome, London, 1962, p.317). The rather wooden quality of the drawing and lack of action make this composition different from the rest of the set and hence the possible attribution to Giuseppe Manocchi (c.1731-82) or to Agostino Scara (see also Adam vol.7/38) of whom James Adam wrote that he '... draws figures full as well as Brunias, is simple and modest, not ambitious, good natured and will soon become skilled in the ornamental way' (Fleming, op.cit. p.279). In his essay of 1762, James Adam discussed the problem of scale, noting that: 'To avoid this in some measure I myself have followed an idea of the ancients and have placed on the top of a high pediment a figure in a triumphal chariot drawn by four horses' (Fleming, op.cit., p.318). This composition is probably inspired by the quadriga relief of Marcus Aurelius in the Palazzo dei Conservatori, Rome. There is a drawing for the chariot of the quadriga in Adam vol.7/107 and it is shown in the later elevation of the Parliament building in Adam vol.28/2. In Adam vol.7/73 there is an unfinished design showing a similar chariot drawn by six horses, which has similar pencil guidelines.